Buzztime Entertainment, the interactive gaming network, is played and enjoyed by hundreds of thousands of people at home, in sports bars, and in restaurants. Now this popular game is available in book form--but unlike other trivia books, these are actually fun to play. While other books reveal the answers below the questions or group all of the answers together, the Buzztime format allows you to see only one answer at a time. That way, readers can play along. Besides being packed with challenging questions, the Buzztime Trivia Series provides fascinating facts along with the answers. These are no ordinary trivia books! The Buzztime Trivia Series is designed to put your knowledge of movies, radio, television, sports, and music to the test, with each celebrity author putting a little of himself in each game. And with dozens of individual games--nearly a thousand intriguing questions!--each book is bound to provide hours of stimulating competition. From cover to cover, the Buzztime Trivia Series is pure entertainment. Joe Franklin (born 1929) is a radio and television personality from New York City who hosted the first television talk show. The show began in 1950 on WJZ-TV (later WABC-TV) and moved to WOR-TV (later WWOR-TV) from 1962 to 1993. Known as the "King of Nostalgia", Franklin's highly-rated show focused on old-time show business personalities. 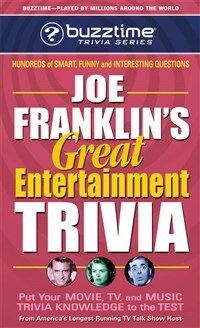 Franklin would delight his audience with trivia about the most obscure entertainers from out of the past, and equally unknown up-and-comers from the present. His guests ranged from novelty performers (Tiny Tim, another person obsessed with entertainment of the past, was a frequent guest) to popular mainstream show business entertainers like Bill Cosby. This show was often parodied by Billy Crystal during the 1984–1985 season of Saturday Night Live. After retiring from the TV show, Franklin concentrated on an all-night night radio show, playing old records on WOR-AM on Saturday evenings. He currently interviews celebrities on the Bloomberg Radio Network. Franklin interviewed over 100,000 guests during his 43 year TV run. These included five U.S. Presidents, and screen legends such as Charlie Chaplin, John Wayne, Marilyn Monroe and Cary Grant. An author, Franklin has written 23 books. He has starred as himself in countless films, notably Ghostbusters and Broadway Danny Rose. 49 What Became of. . .